Polka dots may remind us of the charming styles of the 1950’s, but they are back in a very modern way. This print is not only endearing but polka dots are also extremely versatile. They can be taken from workwear to weekend wear in a flash, making them a timeless wardrobe staple. Get the Look: Julia is wearing the Timeless Tee (Black and White Polka Dots, S), Envious Denim (White, 5). To keep your look casual, yet trendy, ensure the rest of your outfit is simple. Pairing this print with something basic like white denim will allow your top to speak for itself and stand out in a more subtle way. Add a pair of matching shoes and a handbag and you’re set! Get the Look: Julia is wearing the Timeless Tee (Black and White Polka Dots, S), Envious Denim (White, 5), One Step Ahead Sneaker (Black, 39), Anything but Ordinary Handbag (Black). This trendy print is playful and sophisticated all at once, making it one of our go-to prints for workwear. Don’t be shy when it comes to mixing a print with a colour either. We’ve added a blush loafer and handbag to really tie this dressy look together. 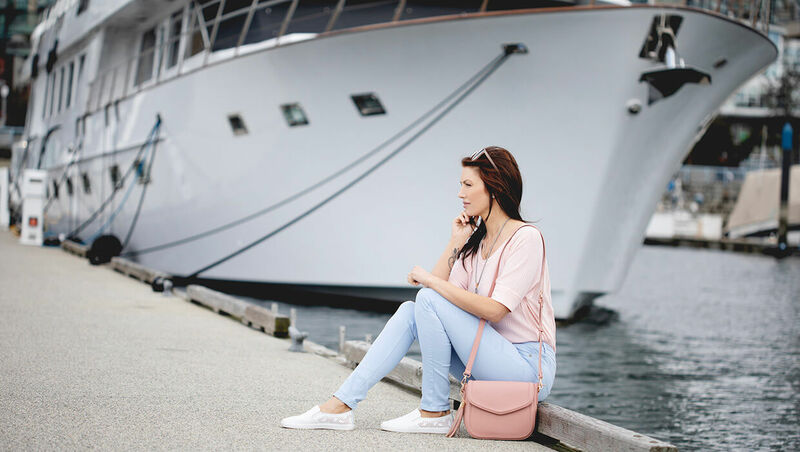 Get the Look: Julia is wearing the Timeless Tee (Pink and White Polka Dots, S), Swept Away Crop Pants (Dark Navy, S), Poised for Success Shoe (Blush, 8), All Around Town Handbag (Rose Pink). When tucked in, a polka dot top has the potential to create a more sophisticated and classier look. When paired with our Swept Away Crop Pants, we create a dressier look, more suited for work or a dinner out. Get the Look: Timeless Tee (Black and White Polka Dots, S), Swept Away Crop Pants (Black, S). Hop on the sophisticated and fun polka dot trend this spring and summer with our Timeless Tee! Go from the office to the patio in style with this one-of-a-kind polka dot top. Now that you know how to dress this top up and down, you should be able to rock this trend with confidence! Get the Look: Timeless Tee (Black and White Polka Dots, S), Rock with You Jacket (White, S), Swept Away Crop Pants (Black, S), Poised for Success Shoe (Blush, 8).